With support from the Siebel Energy Institute, researchers at the University of California, Berkeley; Massachusetts Institute of Technology; and SLAC National Accelerator Laboratory are collaborating on tools that can help utility companies predict energy spikes from the increasing number of EVs. Utility companies manage power so it’s available when they expect peak demand, like when customers will be using air conditioners on a hot day. In the near future, utilities will also need to plan for the electricity demands of millions of charging electric vehicles, each of which can draw as much electricity as an average U.S. household during peak electricity use. Transformers along the typical American power system are often already running at or above capacity. Adding just a few dozen charging EVs could overload a transformer, prematurely aging the equipment through overheating, and potentially causing equipment failure and power outages. 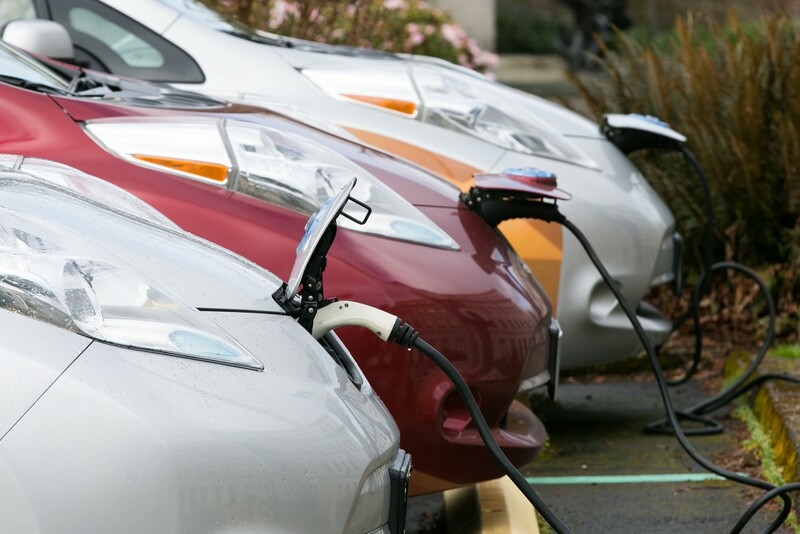 With support from the Siebel Energy Institute, researchers are collaborating to create tools that can help utility companies predict energy spikes from the increasing number of EVs. With support from the Siebel Energy Institute, researchers at the University of California, Berkeley; Massachusetts Institute of Technology; and SLAC National Accelerator Laboratory are collaborating to create tools that can help utility companies predict energy spikes from the increasing number of EVs. The project, “Understanding the Impact of Electric Vehicle Charging on the Power Grid: An Urban Mobility Perspective,” is the first study to use real-world EV charging station data and cell phone GPS traces to analyze the interaction of traffic patterns and EV charging loads on the power grid. Scott Moura, an Assistant Professor of Civil and Environmental Engineering at UC Berkeley, together with Professor Marta Gonzalez from MIT and Dr. Emre Can Kara at SLAC, are developing charging algorithms that schedule power usage so as to not overload the grid while still meeting mobility demands. Ultimately, Moura hopes the research, which will be publicly available, will allow power providers to forecast EV energy demands much like the weather. RWE AG, the second largest electricity producer in Germany, is already using the the project’s data-driven analytics to profile and segment EV users. Profiling how much energy drivers consume (i.e. how long they are plugged in) dictates how many charging stations are needed, while understanding where drivers go helps determine where charging stations are needed. Moura spoke with the Siebel Energy Institute about the project. Q: What motivated you to pursue this project? As a kid growing up in Los Angeles, routinely sitting in traffic, I was fascinated with getting from point A to B sustainably. As I learned about EV charging impacts on the grid, I realized this is an immensely important societal challenge. If done properly, electrifying the vehicle fleet can enhance energy sustainability in both the transport and power system sectors. If not done properly, then EVs could exacerbate reliability concerns and increase ratepayer costs. Q: How can EVs increase the sustainability of the power system? Renewable energy, like solar and wind, enhance power system sector sustainability. The problem is that solar and wind power are inherently intermittent. However, EVs can be used to store energy, so you can take advantage of this by charging EVs when there is excess wind/solar and avoid charging EVs when there is deficit wind/solar. This is how EVs can be a linchpin technology for enhancing energy sustainability in the power system. Q: What was the most daunting challenge you and your team had to address? Data-driven research is difficult. Your data is typically massive, unorganized, incomplete, erroneous, and not oriented to answering your research questions. For example, our EV charging station data represents charging sessions in public locations only. We want to understand how they charge at home as well. Similarly, our cell phone mobility data represents all travelers, not EV drivers in particular. Luckily, statistical methods have advanced far enough to construct algorithms that infer the information we care about – namely the complete mobility and charging session profile of EV drivers. Q: The increasing prevalence of EVs is a big scale concern for utility companies. How is this research complimenting (or different from) what the utilities are already doing to mitigate the potential negative impact of EVs? Utilities must worry about maintaining reliable energy delivery in the face of unexpected outages, growing EV penetration, and even the recent boom in residential solar. For this reason, they tend to be reactive. We, in academia, have the luxury of thinking proactively about the grid impacts of increasing EV penetration. This enables us to provide forward-thinking recommendations to utilities about siting charging stations and EV charging schedules, as opposed to reacting to issues as they arise. Q: Study source material includes data from EV charging stations and anonymized phone call records. How do these two sets of information come together in a meaningful way in this research? Charging station data tells us when someone arrives, when they leave, and how much electricity they consumed. It does not, however, tell us anything about their origin, destination, or commute length. The anonymized phone call records help fill those gaps. Q: Your team has developed a model of mobility profiles in the Bay Area. What does the model look like and what does it reveal? The model, ultimately, organizes statistics. Specifically, it provides the probability of EV drivers commuting from one zip code to another. Sophisticated algorithms convert raw real-world data into informative mobility profile simulations. This class of models, known as “agent-based modeling” is typical in transportation. Our model reveals that EV charging is often concentrated in time and space. For example, we see relatively high concentrations of EV drivers commuting from the East Bay to Mountain View and charging immediately upon arriving at work in the morning, creating demand peaks around 10am. Q: With the initial data analysis complete, how would you characterize the findings so far? Have you come across anything unexpected? Some findings are intuitive. For example, there are easily predictable charging demand peaks after EV drivers arrive to work and start charging. What I did not expect is the relative ease of spreading this peak. Interestingly, incentivizing commuters to arrive 15 minutes early, or delay their charging by 15 minutes, can dramatically reduce peak charging demand by evenly spreading it across the day. Q: What would it take for these modeling and control tools to be adapted into a functional platform that a utility company could use? Data collected over time would reveal when and where EVs would be charging. This could give the utility companies a 24 hour warning when, for instance, a particular transformer could potentially be overloaded at a particular time. Another service would be automated charging. For example, a home EV charger could be set to ensure your car is charged by 7am, but the charging cycle could be optimized to support power system reliability while still ensuring that the vehicle has a sufficient charge to meet their mobility needs. Q: What role could incentives for consumers play in the effort to prevent spikes in power use from EV charging? Incentives will play a crucial role. For example, incentives could be provided for arriving at work early, thus enabling utilities to spread the power demand over time. Similarly, incentives could be provided for allowing the EV chargers to slightly shift or modify their charging schedules to enhance power system reliability. Ultimately, incentives will provide financial benefits to both consumers and utilities by avoiding outages and expensive, over-engineered infrastructure upgrades. Q: Would you say that delaying power infrastructure upgrades is the most important outcome of this work? Delaying costly and potentially unnecessary power infrastructure upgrades is an important outcome. However, I think the most important outcome is to provide data-driven and evidence-based examples demonstrating how increasing EV adoption will impact the electric grid. These would inform a decision support tool that considers infrastructure upgrade deferral, incentives for shifting EV charging demand, and more. Our role is to provide utilities better tools to address challenges of the next 50 years, and help guide an evolution toward more sustainable and resilient communities.